A cross-functional team (CFT) is a group of selected qualified peoples from different functions skills together to achieve specific goal. The concept behind the CFT is effective monitoring, controls, and improvement of the each function of organization. Normally, it may includes employees from top to bottom levels from management of an organization. Generally, Cross-functional teams are establish in organization for completion of any specific tasks to comply internal requirements. The selection of each team member’s depends upon it’s qualifications, experience and functional skills.It may include people from human resources, production, quality or any different functions. Generally, management is gives a duties & responsibility to each member of cross function team. As you know, motive behind establishment of cross-functional team is, completing any specific task with successful efforts. But its all depends on management requirements, and standing tasks with company. To comply requirements of standards & management necessities. A CFT playing role in manufacturing, engineering or any type of industry. That needs to potential improvement and innovation process enabling knowledge sharing and process improvement by management approach. The general purpose of the establishment of CFT is to managing internal tasks with effective form. When you are expecting a entire system improvement, CFT may helps in this regards. The best part of the CFT is, the peoples are comes from different functions and skills. Hence, it is easier to understand issues & identify solutions for overall improvement. It may easier for each individual function monitoring, and takes decisions for improvements. Even, each team member can technically solve their problems at function they are comes from, without any management involvement. When the company needs to develop new product or parts / new materials, product development having requirements for CFT. To verify, identify and conduct condition for improvement and reporting. Company can also establish for supplier quality improvement. The part of vendor development is also important part that management can establish cross functional team. For improvement by supplier auditing & ranking, supplier internal management inspection and auditing for compliance of standards. Quality cost is one of the important part of the cost center as well as directly impacting on quality of product. That this important task is also valuable for company to establish cross functional team for reviews, monitoring and controls over quality cost. The above examples are generally conducting in small scale or middle scale industry and are practically works. The managing of each activity, and its concern practices are conduct by teams. As duties and responsibilities assign during establishment of team. The top management had identify internal system requirements, resources requirements and system improvement. Tasks are conduct and determine improvement action plan. For the managing internal management system, manufacturing and supporting activities concern quality product & customer satisfaction. The top management is determining requirements of cross-functional teams to provide system improvement tasks. And identify general requirements and specific requirements to managing and assignment of project tasks. The management is responsible of selection of peoples from various department with different functional and experience. The top management shall assign responsibility to team. With the involvement of internal management system. Or any improvement tasks as establishment of CFT’ motive. The team shall include representative from various departments like production, quality, procurement, stores. And some cases are also involve of customers as appropriate requirements. The teams are conducting assignments as per management provide specific tasks that can include various tasks that are consider as regular. The cross functional team shall conduct the product propose designs, product development, customer concern services, product design and research and internal management system are general for CFT or generally management practice to provide such tasks to teams establish. But some specific tasks that can assign by management for overall improvement like quality costing and product quality accounting. Overall the purpose of the establishment of cross functional team to managing tasks by crosses functional teams, and effective implementation. Management considering effective management of most valuable resources of organization is peoples. 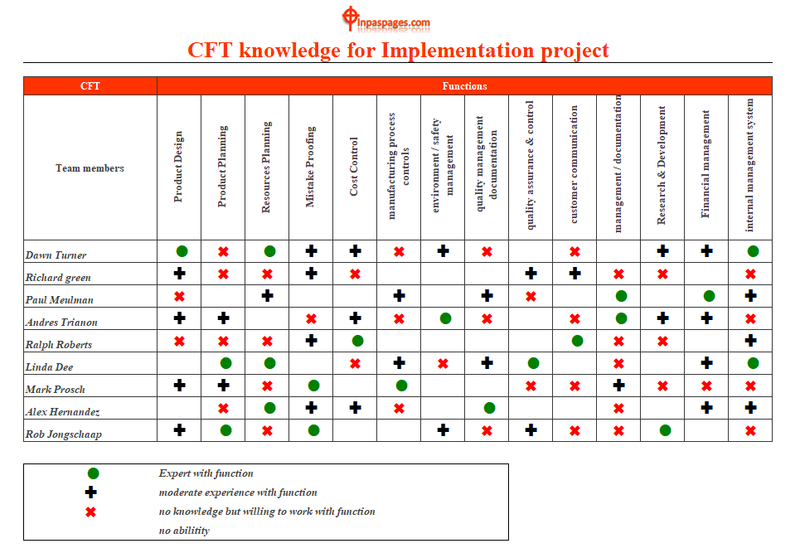 implementation of any specific tasks or regular tasks are manage and responsibility assign by management to CFT define from all level of management. In any tasks or activities, implementation or successful completion of any project. Management is playing important role that provides resources and response to arrangement of resource requirements and any project implementation permission. The CFT is also expecting from top management for permit to response positive & consent. The top management commitments are important for any tasks implementation. hence, they need and must be agreeable to assign require resources like manpower, financial support, statutory and regulatory requirements, information and concern services are major resources that needs. The cross functional team is strength is information, CFT get greater scope information and the information. Which having should be very detail, because the CFT is built by peoples who comes from various department & well experiences in on their fields. So the each function information are comes from various fields, that is very important & require part of cross functional team. That on each issues or query can immediate identify and provide solutions on group discussions. The implementation of various projects, needs to manage documentation for identify contingency as per project requirements. It is appreciate, all the basic plantation and compliance of project are match with each team member’s experience and skill. See picture below given as example for skill chart that help to determine deployment of team member in the projects to successfully complete project tasks by individual involvement and contribution of each tasks. As per cross-functional team skill chart, management determine deployment of each team member as per select project for implementation for cross-functional team. CFT that assign duties and responsibility for particular tasks to individual member. Each member is plan for the project, manage, determine appropriate decisions for project. All the individual is discipline it’s project frame work of project, resources monitoring and control as appropriate project requirements. Cross-functional team is determining project plan and its structural planning against management. That include the vision and mission. How the mission will be implementation to achieve target goals and achievement on implementation of project plan. In the project management, all require resources, defining milestones and integrate tasks are includes, that management is verify and approve require resource accordingly.